Battle Girlz Average 0.00/5 - out of 0 total votes. Yunna used to be one of the best child mecha pilots in the universe, but the UEG replaced her with a faster android pilot. The young mech pilot, however, is in for more than she realizes: for Arlan sits at the edge of the universe, and enemy alien attacks are all too common there! 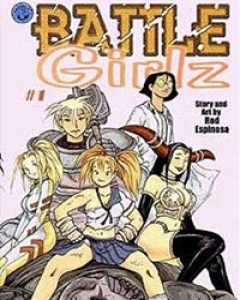 A new series by the creator of The Courageous Princess, Rod Espinosa, Battle Girlz is a story of a team of Supreme Heroines from different backgrounds, Expert Mech Girl, Super Mighty Girl, Powerful Priestess, Nerdy Gadgeteer and Seductive Temptress, gathered together by a legendary goddess to live in her strange mansion and to fight evil across the universe and beyond.